Advantages: Norton SG ceramic uses heat-treated alumina grain; latex glass latex paper P80-P120; water-based No-Fil layer, no pigment in No-Fil; higher speed; resistant to obstruction during use; there is no risk of color transfer; reduces downtime; quick and easy change. Installation: To be used on an O150 mm self-adhesive container for orbital sanders. 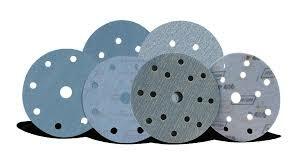 The disc are available in the P80, P120, P150, P180, P220, P240, P280, P320, P400, P500, P600, and P800 grain ranges. High-tech latex paper B-weight reinforced fibers provides 50-60% better resistance to rupture and flexibility. The film coating provides maximum load resistance and prolongs life.